After trying unsuccessfully to enroll Dr. Glenn Wheeler in the only guide-dog school in the U.S., Charles A. Nutting, Donald P. Schuur and S.A. Dodge of the Detroit Uptown Lions Club took matters into their own hands. If their visually impaired friend and fellow Lion couldn’t attend a school in New Jersey to be paired with a guide dog, a training center and canine companion would have to come to him. While dogs have assisted the blind for centuries, modern dog training methods trace their roots to Germany, when thousands of soldiers returned home from World War I blinded from poison gas. As training techniques spread to other countries, including the U.S., demand for these valuable dogs grew. With a well-trained guide dog and instruction, the visually impaired could better navigate an increasingly busy world. The dogs could warn their handlers of everything from oncoming traffic to obstacles in grocery store aisles. To help their friend and others like him, Nutting, Schuur and Dodge led their club in establishing a guide dog training school close to home. In the fall of 1938, the initial program graduated four student-dog pairs, including Wheeler and a dog named Hilda. Searching for a name for their new venture, three Detroit-area Lions Clubs held a contest for the entire Lions organization. The Coulterville Lions Club of Illinois submitted the winning entry: Lions Leader. On April 4, 1939, Lions incorporated the Lions Leader Dog Foundation as a nonprofit, rented a small farmhouse for the operation in Rochester Hills, Michigan, and graduated its first official class at a cost of US$600 per team. A year later, the school dropped the word “Lions” from its name because the project was not an official program of Lions Clubs International, and the group wanted to expand its base of donors. 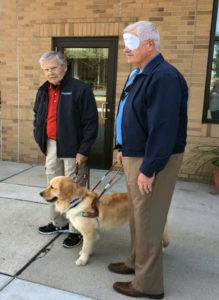 Known today as Leader Dogs for the Blind, the school has graduated more than 14,500 guide dogs since opening its doors. But its impact has been far greater. As one of the first service dog schools, it helped to popularize the idea of service dogs and started a movement by Lions to support training programs. By the mid-20th century, Lions were supporting guide dogs schools in the U.S, Italy, France and Germany. The school’s training methods have changed over the years, and its programs have expanded to help those with hearing loss, diabetes and other health issues. But, its purpose has not altered. The center exists to provide help, not to make a profit. Although clients were once required to pay up to US$150 for training, the service has been free since 1958. Clients also receive housing and transportation while at the center. Today the average cost of training a dog is US$37,000, and Lions clubs and other individual donors and organizations provide all funding. What started as an idea to help one man has turned into an effort that has helped many more. Currently supporting training schools in Canada, France, Italy, Japan, Norway, South Africa and the U.S., Lions are helping thousands of visually impaired people to find new independence—and often a new best friend.